New Partners & Cryptozoology Near done! Though the website is not complete the cryptozoology section is about done and Unknown Explorers has further expanded its paranormal network. As many of you know, UE & TAPS have teamed up to get answers in the unknown. Unfortunately there was a magazine mis-print and our ad was published months early! VISITORS - stay tuned for a complete site soon! The internet's central hub for exploring anything unknown. Here you will find some of the most content rich information regarding cryptozoology, aliens & ufos, ghosts & the paranormal, space and anything else left in mystery. 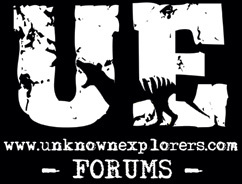 Unknown Explorers also has weekly articles from some of the most respected investigators from around the globe. UE takes on all the elements of the unknown by using theoretic and scientific approaches to find out what really is going on in our world and to debunk falsified claims. The passion and opinions of all our members are both respected and analyzed thoroughly. From the study of unidentified animals to claims of demonic hauntings, UE takes on the whole picture. Choose your line of research and indulge yourself in the mysteries of our world. 12th century art of a sighting in 776 during the siege on Sigiburg Castle, France. One of the most controversal photographs of all time. In week one UE had to put the 1967 Patty bigfoot up. This 15th century tapestry depicts the life of Mary. A Disk shaped object can be clearly seen.